If you were around during the 1990’s, then it stands to reason that you remember how big of a deal the X-Men were at that time. I mean, not only did you have the animated series creating new fans every day, but there was also an expansive toyline and the comic books were arguably booming more than they’d been for some time. In addition to the flagship titles like X-Men and Uncanny X-Men, True Believers also had the likes of X-Factor and X-Force at their disposal, each of which featured remarkably different lineups and new ways of utilizing these dynamic characters. Believe it or not though, X-Force almost didn’t find its way to shelves, as comic book legend Rob Liefeld recently spoke of in an Instagram post. 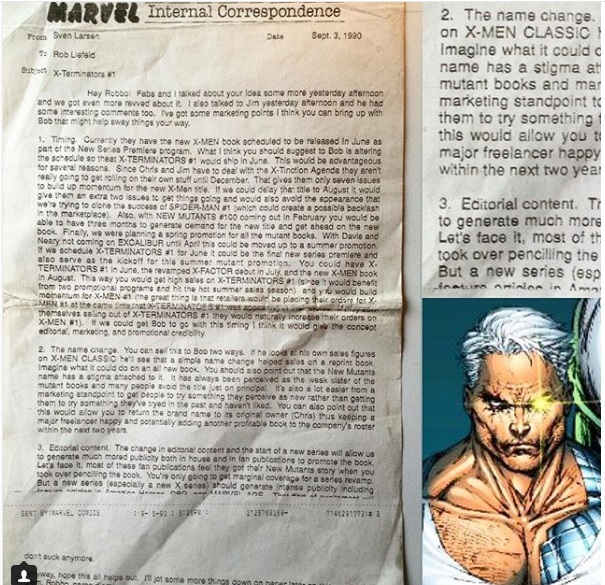 Using a declassified internal memo from Marvel as an example, it “contains the battle plan of how to turn the no’s into the all important green light that eventually produced X-Force, referred to as X-TERMINATORS here prior to the name change.” In other words, if you believe you have something special on your hands, keep beating down doors. Well, we’re glad that he persisted, as the writer/artist reminds us of how “X-Force #1 sold 5 million copies and remains the 2nd best selling title in comics history.” And thanks to that foundation being laid, it’s opened the door for other great creators like Craig Kyle and Chris Yost, who had a definitive run of their own, in addition to a movie set to spinoff from Deadpool 2.